The old Ikea fleece blanket serves as an internal lining that will stop the glass bottles from knocking each other, while giving the bag a soft spongy feel. 2. 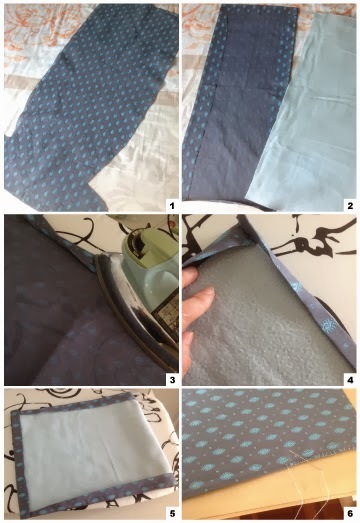 Trim the fabrics into equal size, leaving excess on the sides for the printed one. 3. Double-fold in the side of the printed material all around, securing by ironing. 4. Wrap over the trimmed old Ikea blanket, fold the excess sides around it. 5. This is how it should look now. 6. Fold the layered fabrics in half (printed one face out) and stitch the bag up, leaving the top as opening. When this is done, stitch the middle together to make 2 bottle pockets. Found an old bag strap and made it the straps. Great post! My wife and I were just looking over your blog and had a quick question. I was hoping you could email me back when you get the chance. Thanks!